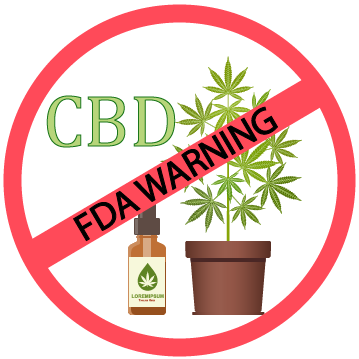 Three of the FDA warning letters in the past week have been concerning products containing CBD. Looks like they are starting enforcement activities in this area. All three of the warning letters (to PotNetwork Holdings, Advanced Spine and Pain, and Nutra Pure) cited similar violations. And that’s just a sampling of the various claims made by the three companies! Of course, CBD has not been approved as a treatment for any of these things, and so making the claims causes the product to be an unapproved new drug. Several of these companies also stated or implied that their CBD products were food or dietary supplements, or that they could be ingested. They were cited on the basis that CBD oil is already approved as the active ingredient in the approved drug product Epidiolex. It it illegal to include an approved drug active ingredient in a food or dietary supplement. Unline most warning letters, these letters included a section on potential violations of the FTC laws, which say that it is unlawful to advertise that a product can prevent, treat, or cure human disease unless you possess competent and reliable scientific evidence … subsctatiating that the claims are true at the time they are made. Recipients of the warning letters were told that the FTC was concerned that some of the efficacy claims made for the products may not be adequately substantiated, and they should contact the FTC to address those concerns (within 15 days). None of these letters made any reference to any cosmetic claims that may have been made about the products. Exactly why I chose not to deal with CBD at this point. I know there are others who do but I think they are playing with fire. Thank you for this post. With all the push from certain companies to sell, it affirms my stand right now.